Trombonist Nick La Riviere’s community big band, JIVE (the Jazz In Victoria Ensemble) performs a mix of swing dance classics, traditional big band hits, and even a little disco. 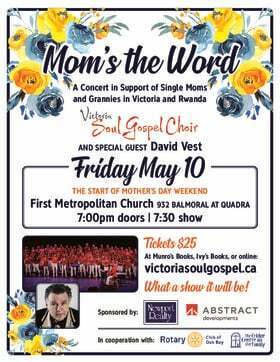 The 18 piece band features the sultry vocals of Bob Nelson, and is guaranteed solid entertainment. Opening for Jive is Bowker Creek. This bluegrass band features Bonnie Jean Duncan on guitar & vocals, Duncan Sutherland on guitar & vocals, John Cornes on bass & vocals, Danny Ready on mandolin & guitars, and Doug VanDine on Banjo. The band has played together since 2009 and been a hit at various music festivals - and even opened for Fred Penner. 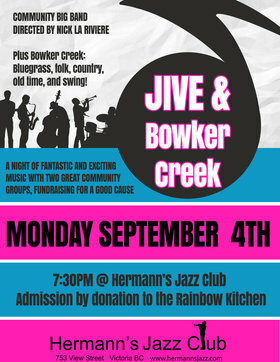 Admission is by donation to The Rainbow Kitchen, so come on out for some good tunes and support a good cause!